ROAD TOWN, Tortola, VI- The popular radio show ‘Honestly Speaking with Claude O. Skelton-Cline’ continues to attract some of the biggest movers and shakers in the Virgin Islands, with the guests on the ZBVI 780 AM programme yesterday, March 20, 2018 being Deputy Premier and Minister for Natural Resources and Labour, Dr The Honourable Kedrick D. Pickering (R7) and Deputy Governor, Mr David D. Archer, who made a brief appearance. For most of the show, it was a passionate discourse between Mr Skelton-Cline and Dr Pickering on the controversial Recovery and Development Agency, which will be debated in the House of Assembly on March 22, 2018. There have been many concerns about the Agency, including from the Backbenchers who have publicly expressed that they will be making those concerns heard during the debate. 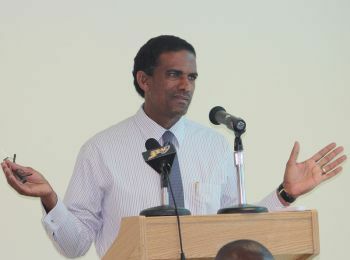 Among the major concerns are that the United Kingdom (UK) Government does not trust the National Democratic Party (NDP) Government to manage the monies to be borrowed, hence the UK mandated independent Agency; that the Agency will infringe on the Constitution of the Virgin Islands since it will bypass the Minister of Finance in determining how monies to be repaid by taxpayers will be spent and that the Agency and its formation have been kept secret, even from elected members of Government. But, according to Dr Pickering, the Recovery and Development Agency puts in place a check and balance that protects from corruption. One of the reasons persons may have concluded that the UK distrusts the ruling NDP Government of Premier and Minister of Finance Dr The Honourable D. Orlando Smith (AL) is that the Government has repeatedly failed over the years to bring audited financial reports to the House of Assembly, has refused to be accountable in the House of Assembly when grilled on major expenditure by the Opposition Members and have generally left the public and even some of their elected members in the dark on major policies. Opposition Leader Hon Andrew A. Fahie (R1) has already labelled the incumbent government the most corrupt in the history of the Territory. Added to that previous Governor John S. Duncan OBE had lambasted the NDP Administration for reckless spending and lacking priority. He added that the mechanism is just like how a bank would dispense its money for a mortgage with persons to ensure the money is used only for the stated purpose. 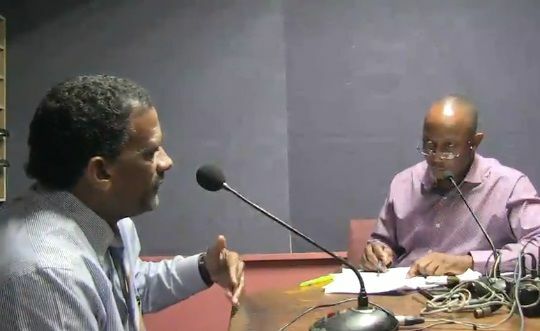 Commentator Mr Skelton-Cline; however, said he had issues with a government being elected but is not trusted and not have full authority over their financial matters. “Pastor, they are the ones giving you the money. They have a right to determine what they want to see in order for them to give you the money. That is their responsibility. Our responsibility is to determine how we agree or don’t disagree with that,” Dr Pickering responded. Mr Skelton-Cline did not particularly agree with Dr Pickering as he had a challenge seeing the UK setting the ground rules, including a check and balance mechanism, if they had indeed trust the VI Government. “Don’t you not have a Board of Trustees in your church?” Dr Pickering asked. Mr Skelton-Cline answered “Yes,” adding that the Board of Trustees is mandated by law. “But you have a Board of Trustees to ensure that the pastor don’t do his thing outside of his own personal responsibilities, the pastor still sits on top of the church,” Dr Pickering argued. He, however, said he disagreed with Mr Skelton-Cline when he seems to suggest there is a hidden agenda with the UK Framework on the BVI Recovery Plan. “I think the weakness in communication does not in any way convey any such thing and I would wish to go against that idea that there is some hidden agenda,” Dr Pickering stated. That still won't stop corruption with yahll, hearts to dirty. It's strange that these Men can communicate verywell for Campaign for elections, with their Marraiges and now all of a sudden very weak to communicate with the public about the UK Recovery Plan. I personally deel the Communications are weak becausw of their Guilty conciens with what them about to do to us all. Liar cant be folled by spinning words around. My thoughts exactly. ..WHO GOING TO WATCH THE AGENCY!!! Corrupt people providing a recovery agency to prevent corruption?! Lollllllll!!! But if you think about it, RE-COVER means to cover something back up again. So if you smart it should be a DIS-COVERING AGENCY. Last time i check when ever you put "Re" at the front of something it means to do it again! We all know these people will recover anything that has been discovered in respect to their deceitful governance. UK and international lending agencies who are imposing the conditions are not corrupt. You know Too Thief was the name of a legendary race horse in the UK at The Royal Ascot. He was an undefeated Champion. Guess what he won 80 percent of his races by a nose. It was said he lived up to his name because he came from behind to always win his races. He was a real thief. That is the best I have ever heard this whole recovery plan explained. Hope the backbenchers and the opposition vote yes on Thursday. "Protective Mechanism". i don't accept that point at all. The Government, Financial Secretary/Ministry of Finance have enough rules and regulations for Accounting Officers of Ministries and Departments to follow already. Every Head of Department,Permanent Secretary/accounting officer has a vote ,heads and subheads to which funds (digitally connected to the Ministry of Finance) are allocated based on the approved budget and permissions is given by Ministry of Finance to spend. A department /ministry can request and with permission move around funds within certain accounts except those relating to Salary,wages, rent etc. Funds allocated to a specific vote (stationary) are expected to be spent on the purpose (you buy stationary). Ministry of Finance with the click of a button knows to a penny what extent any one vote is over drawn or not. A public/Account Officer has to be in "real deep" with all of Ministry of Finance Officers ,the Financial Secretary , the Accountant General ,and officials of the Treasury Department in order to bypass the current financial rules and regulations. So then you have to convince the public that all the officers in these ministries and departments are operating outside of the rules and regulations without any oversight of the financial processes or that the "Ministers" themselves enforce their demand on the officers to bypass the systems in place that things happens and no one is held accountable. So sad we didn't hear him come to the defense of laid off workers. Or offer words of comfort since he is so good at talking. He knows that some companies use the storm to victimized some workers. He said naada. That was a lot of people turn off. That includes me... Alvera was the only member that address this issuem. Since then I got mad respect for her..
what they sayyy. Ooooo I just want to get rid of the entire NDP Government. Heard enough had enough spin. He sell this thing good. Doc need to humble and let Picko do the selling the communicating. Picko is good at that. His Ministries are failing but he can talk. He made a good case and he won me over. I now see the real need for both the loan and the agency..
where is the governor? Still no one gone jail!!! What a tihing to tell the king. In addition to transparency and accountability, good governance includes a)spending appropriated funding for its intended purpose, b) operating within appropriated budget, c) delivering the best service at the least cost, d) avoiding conflict of interest, e) putting public interest ahead of self interest, f)limiting cronyism and nepotism, g)getting value for money, h) keeping the electorate informed on what government is doing.........etc. Does the VI need the UK taxpayers help in recovering from the devastation caused by two Cat 5 catastrophic hurricanes, Irma and Maria? Yes. The VI is an OT under the umbrella of the UK. Though the VI has some measure of internal self government, the UK has control over how the local government execute its fiduciary responsibilities. Further, the UK is guaranteeing/co-signing for £300M ($402M) loan. Though the UK is not directly awarding the loan, as the co-sign, UK taxpayers are exposed to the risk; if the VI defaults on the loan, UK taxpayers will have to make the monthly payment or even be requested to make a balloon payment(to my knowledge, VI has never defaulted on a loan). Consequently, like any lender, the UK has to protect its taxpayers by putting terms and conditions in place for managing any recovery loans. Moreover, words have meaning and every word uttered by a politician, especially one responsible for day-to-day governing, is parsed. Consequently, politicians should apply the carpenter’s rule (measure twice, cut once) before commenting on issues. Though Dr. Hon. Dep. Premier Kedrick Pickering, R-7/MLNR may not have intended to admit corruption, he may have inadvertently done so. How so? Well, by stating that the Agency/Board is needed to avoid corruption may be admitting that corruption may be rife in the public sector and a Board is needed to protect the government from itself. The Hon Pickering no doubt meant well but may have in-artfully communicated his position. Perhaps, the Hon member need to return to Honestly Speaking to clear the air. Their recovery agency need an incorruptible man like the hill man who used to be in immigration. None of them politician have integrity like that individual. das one man they don't like but ur right, his integrity is not for sale. SMFH. This guy is a joke. Well at least he has admitted that they are corrupt. But Kedrick, it will take more than a Recovery Agency to combat corruption in the NDP Government.